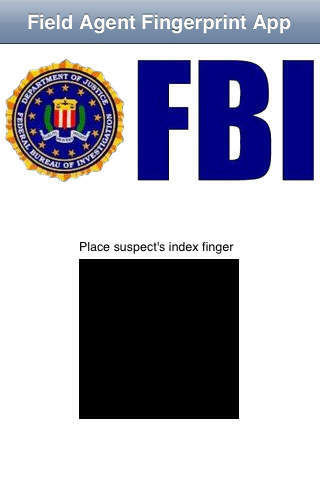 Pull a fast one on your friends...  Are your fingerprints in the FBI database? The FBI fingerprint database contains over 50 million fingerprints and is searched regularly whenever a police officer arrests a suspect. The FBI has taken advantage of the unique touch screen and connectivity of the iPhone and created an app for their field agents - the Field Agent Fingerprint App (FAFA). FAFA enables the field agent to take a fingerprint sample from a suspect in the field and immediately search the FBI database for a possible match. You have managed to get hold of FAFA and now you can offer your friends the service of checking if their fingerprints are in the FBI database. Place your friends finger on the designated surface and his fingerprint will be sampled. You will then be asked to enter your FBI badge number for sending the fingerprint. Unknown to your friend, using special codes in the badge number you enter, you can control the "match" result to be a no match (your friend will be relieved) or a criminal record. You can even make the app match a name from your contact list and control other match characteristics. No fingerprint is actually sampled and no data is really sent. This is purely an amusing joke. In fact, you can run it in airplane mode to verify no data is actually sent. To reach the setting screen triple tap on the white area at the bottom of the screen.